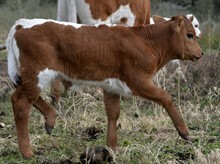 Beautiful (last calf) own daughter of the famous Butler cow Brush Country Queen. We are so lucky to have these valuable genetics in our herd. Queenie gave us a very nice heifer for her first calf. Queenie's black tipped horns are just starting to roll out. We hope she develops the incredible twist of her well-known dam. We successfully AI'ed Queenie to CV Casanova's Magnum. This mating with a big bodied 90" TTT lateral horned bull should be an excellent cross! Queenie had a gorgeous Magnum HEIFER calf in November 2017- we are thrilled with this knockout calf! Tip to Tip 39.2500 12/21/2015 6 inches in 2.5 months!